At Resurgens Orthopaedics, we think coloring is a great activity to enrich the mind and encourage creativity, not just for children, but for adults as well. The best thing about coloring is that there’s no right (or wrong) way to do it! You can color with crayons, markers, colored pencils, or anything else you like. You can color your favorite superhero or cartoon character with their traditional color scheme, or give them an entirely new look. You don’t even need to color in the lines if you don’t want to! Since it’s National Coloring Book Day, we thought we’d take the opportunity to encourage you to pick up a coloring book and express your creativity. 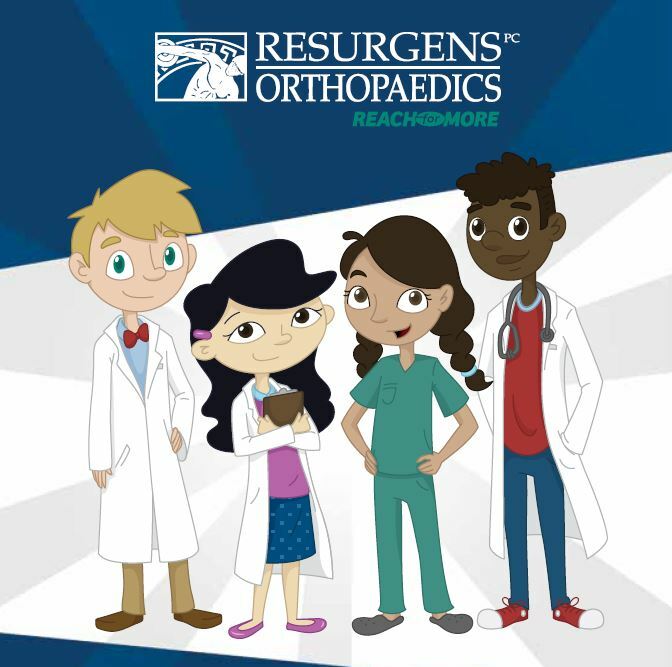 We also want to tell you about Resurgens Orthopaedics’ new coloring book, which is available to download right here on our site, or you can pick up a free copy in our waiting rooms or our public events. While we made this fun coloring book to entertain and educate all the kids out there, we think adults will love it as well; who knows, you might even learn something new while you color! Here’s a little more about our coloring book and its stars, the Bod Squad. Superheroes make for great coloring book subjects; after all, who doesn’t want to imagine themselves as a hero, flying around the city to stop evil? At Resurgens Orthopaedics, we’ve created our own superhero team, the Bod Squad, and they’re a little bit different from the superheroes you’re used to. While some heroes are larger than life, the members of the Bod Squad are small enough to fit inside your own body. And instead of fighting evil super villains, they do whatever it takes to ensure your muscles, bones and joints stay healthy. Communications Officer Chat and Pilot Specs work together to bring your body everything it needs to heal, while Commando Bob fights harmful bacteria and viruses that can cause an infection that will hinder your natural healing ability. When you have an injury, you can be sure the Bod Squad will be there to fix you up and help you make a full recovery. We hope that, as your kids work their way through the Bod Squad coloring book, they’ll learn more about the different processes that occur when their bodies heal from an injury or illness. The Bod Squad has lots of fun activities for kids, like mazes, word finds, and more, all interspersed with fun facts about the human body. They’ll also find tips about how to stay healthy by exercising outdoors and maintaining a proper diet. This coloring book contains hours of fun, so don’t forget to download it or pick up a copy next time you’re at a Resurgens facility!